Don’t get me wrong, making croissants the traditional way is one of the top baking pleasures for me, but there are certainly times when effective shortcuts are called for. And this shortcut is certainly effective in that it gives excellent results and is easier to achieve than traditional croissants. This quicker approach, using grated frozen butter, takes about 20 minutes to make up the laminated (layered) dough. The dough then rests in the fridge before it can be use: this allows the gluten in the flour to relax making the rolling out for the shaping easier. This method simply has the frozen butter grated into the flour at the start, for a more “all-in-one” dough. It then gets rolled out and folded a few times in quick succession. 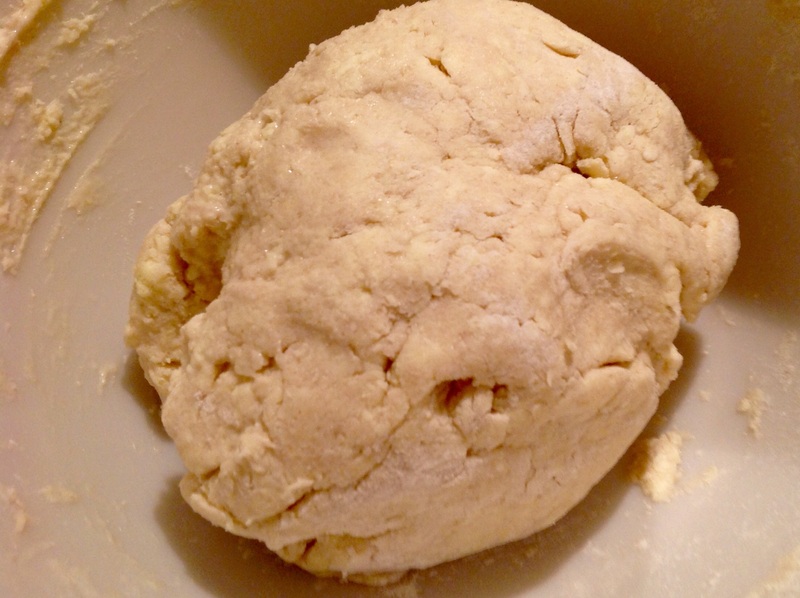 The frozen butter gets trapped between the flour, forming the layers. I started making this quicker version as a boy as I could not make traditional croissants properly at that stage. I took the idea from Saint Delia of Smith, who used this grated butter method in her recipe for sausage rolls in her wonderful Complete Cookery Course all those decades ago: I simply added yeast and put in a few turns. 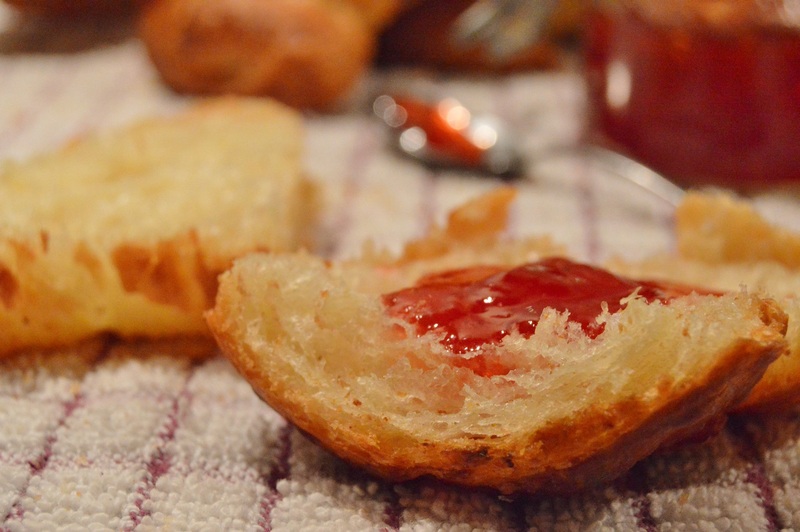 At the bottom of this post I have given photograph steps for incorporating the pastry in small chunks rather than grated: as in the rough-puff pastry method. This is still quicker and easier than the full-on traditional croissant dough, but has a slightly more open interior than with this grated method. Although this quicker dough can be made and laminated in about 20 minutes, the only caveat I would add is that the dough must remain cold while it is being made. So if you are making them in a warm kitchen, or if the dough starts to become at all sticky, be prepared to pop the dough in the freezer for about 15 minutes. On a cold day, though, I normally get all this done in one go. The dough really does need to chill for a few hours after the 3 turns to allow it to relax, thereby making it easier to roll out for cutting and shaping. With this grated butter method, you get slightly random layers and an interior that is not quite as open, but you still get very good, light flaky results. And this approach is certainly both easier and quicker than making a full-on croissant dough. 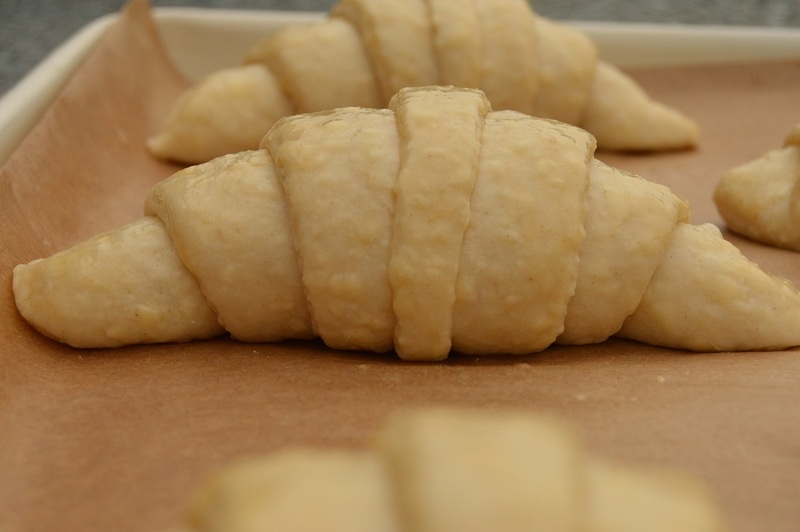 The traditional recipe for making croissants, which has full instructions and photographs for shaping (regardless of the dough you have made) is here. To get the layers you do several turns (rolling and folding the pastry over itself): this lamination is a crucial stage in any of the flaky pastries. 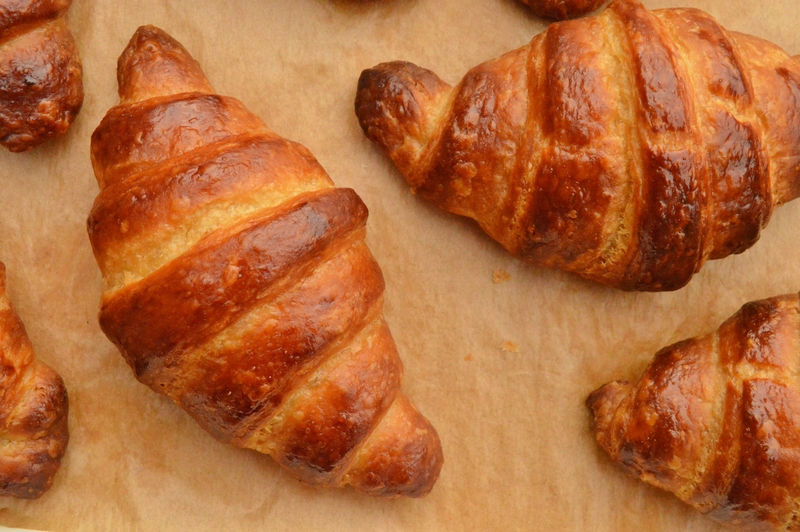 I go for three turns with the quicker croissants, starting with a book turn and then two envelope turns (see the recipe below for these turns). While I don’t often do a book turn with traditional croissants, putting in a book turn for quicker croissants gives extra layers in the dough which I think is needed as compensation for this very quick method. These turns are done in minutes without any resting in between. However, once the final turn has been made the dough should chill for a few hours (or even overnight for the very best flavour). The interior is not as honeycombed as making croissants the traditional way, but they are still light, airy and taste much better than pre-packed supermarket croissants. A good quality butter with the highest fat content you can find is essential: cheap butters often have a higher water content which in turn can cause the butter to shatter while you roll the dough. The cheaper butters are also prone to leaking during the baking. These are not by any means instant croissants, as the dough needs to rest in the fridge once made, as well as time for the shaped dough to prove, but the hands-on time for getting the dough made up and laminated is about 20 minutes. For resting the dough: go for at least 2 hours for the dough to rest in the fridge, wrapped in clingfilm. I like to leave the dough overnight in the fridge for even better results. I sometimes freeze the dough once the final turn has been done, and before the resting. This then gets defrosted overnight in the fridge the night before I want to use it. For the proving (rising): you need an hour or two at room temperature once the dough has been shaped. 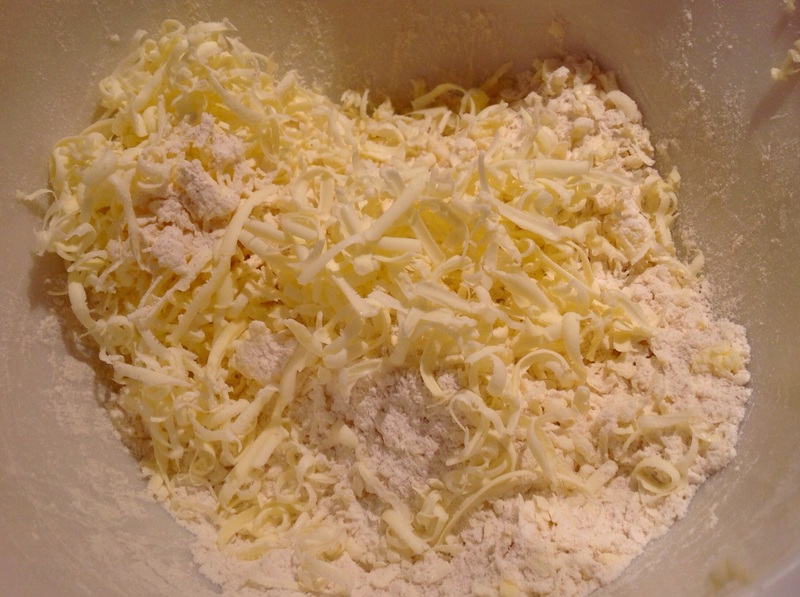 (1) Mix the flour, sugar, yeast and salt together and grate the frozen butter into this mixture. Use your fingers to gently coat the butter strands in flour. (2) Add most of the water and mix gently with a knife to form a soft but not sticky dough, trying not to crush the butter too much. Add more water if needed. (3) Lightly dust the dough and the work surface with flour. 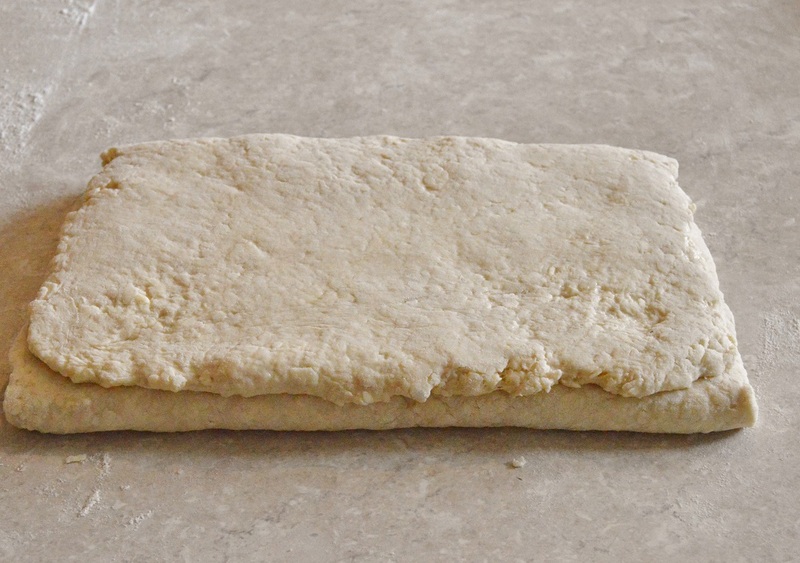 Roll out the dough thinly to a rectangle with sides about 16cm by 65cm: these measurements are just guidelines – you want a long, thin strip of dough that is about 4 times as long as it is wide. It will look quite rough initially but bear with it. 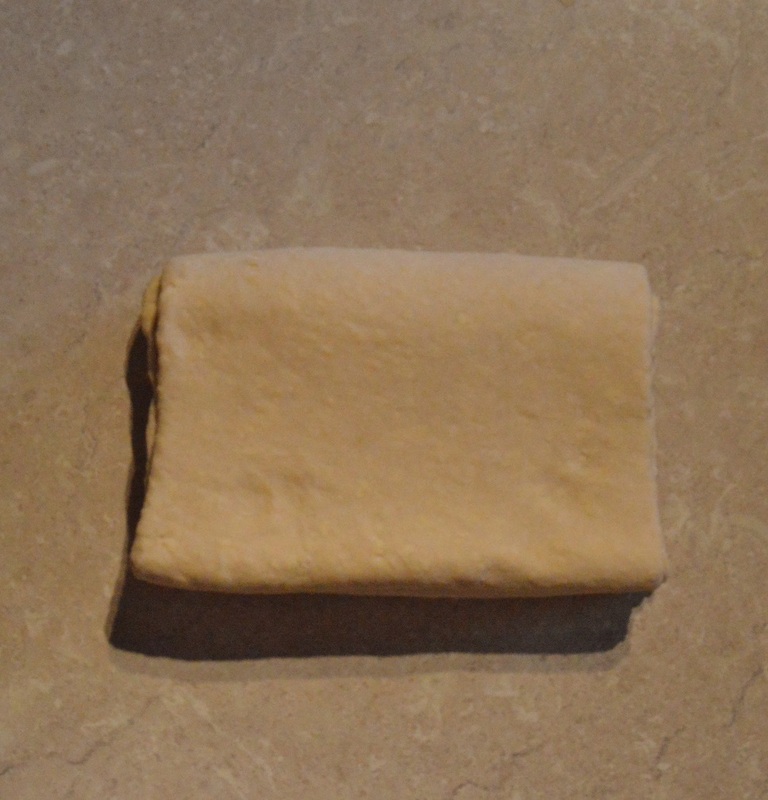 (5) Rotate the dough 90 degrees and roll out to a rectangle about 20cm by 60cm then go for two envelope turns* in succession, brushing off any excess flour at each stage and rotating 90 degrees after each turn. 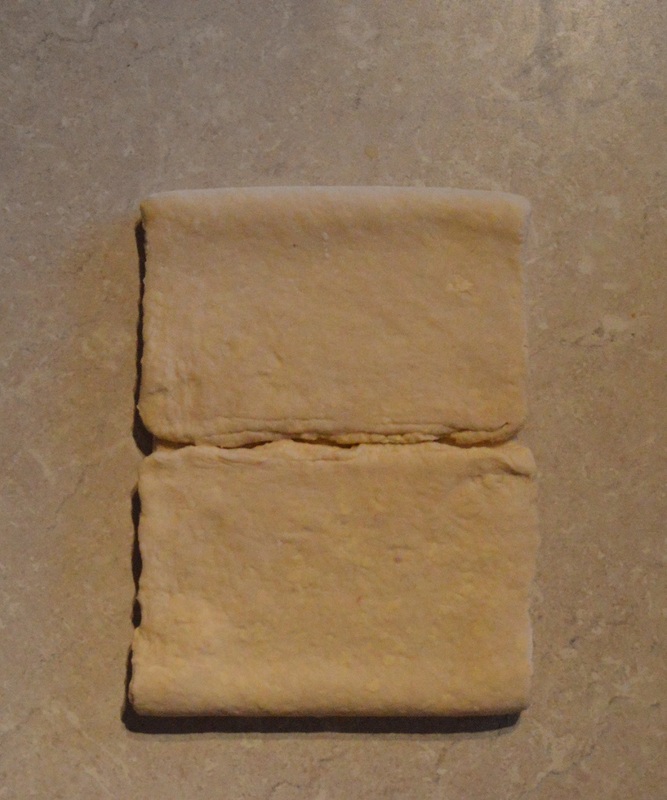 * for each envelope turn, fold the bottom third of dough up and the top third over this (as in the photo below). This is now the laminated dough which just needs to rest in the fridge for at least a few hours before using. NB: if the dough starts to feel slightly warm or sticky at any point, pop it in the fridge for about 30 minutes to chill. (6) Cover the dough loosely with clingfilm and chill for at least a couple of hours to relax it, which makes it much easier to roll out for the shaping. Alternatively, freeze the dough at this stage for using later. 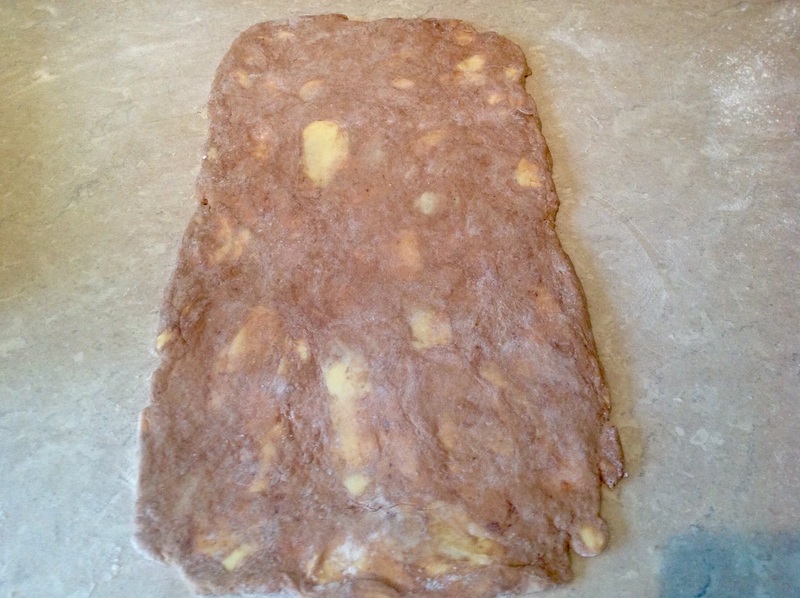 (7) Roll out the dough to a long thin rectangle about 20cm wide, 75-80cm long and about 3-4mm thick. 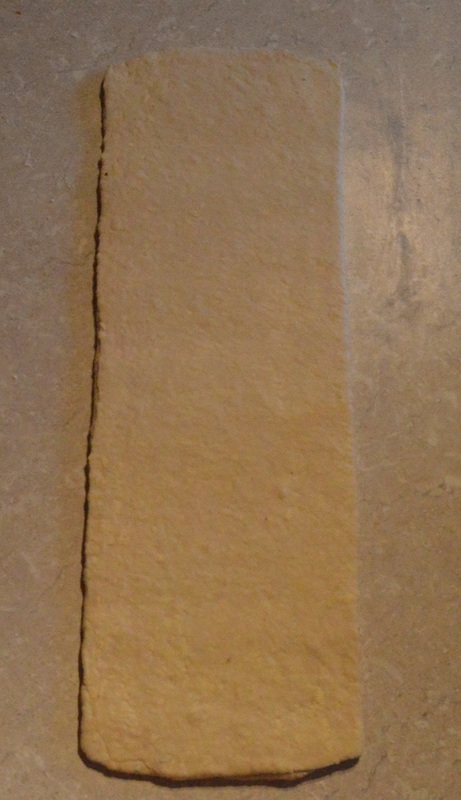 Trim the edges and cut into triangles with base about 12cm and height about 24cm. Stretch them a little, gently, so the point is elongated and roll up fairly loosely: as you roll, also gently elongate the point with your thumb and forefinger to give more of the outer layers. (8) Place on baking trays lined with a double layer of greaseproof paper and pop inside a large bin liner. I usually stand a tall cup or a bottle in there to prevent the plastic touching the dough. 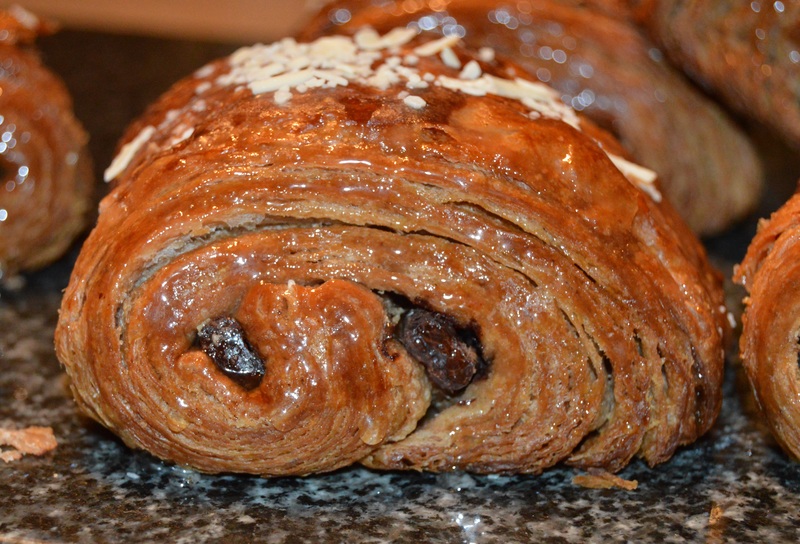 *see my main croissants post for photos demonstrating the shaping of croissants and pains au chocolat. (9) Leave to rise for a couple of hours until they look puffy and have a gentle wobble to them. Brush with the beaten egg yolk. In a cooler enviroment, this might take longer. (10) Place in an oven pre-heated to 220C (fan) and then immediately turn the temperature down to 180C(fan). Bake for about 20 minutes until well risen and golden. Turn down the temperature to about 160C after 15 minutes if they are looking too dark. 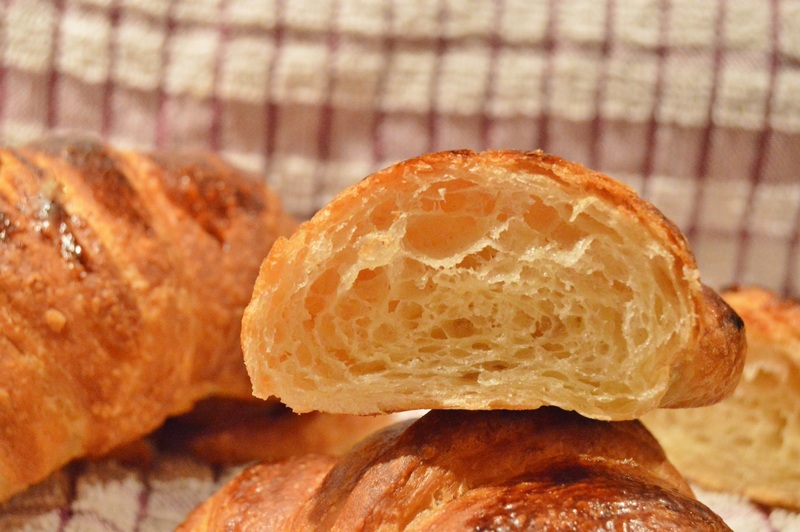 The recipes below are some of my favourite uses of quick croissant dough. And if you have a batch of dough made and frozen from earlier, even better! 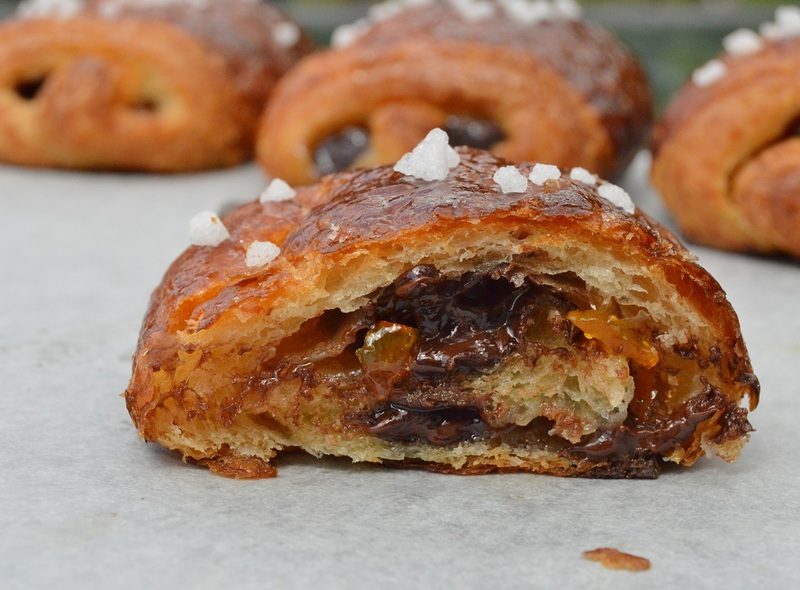 Sticky orange and dark chocolate fillings in light, buttery pastry…what is not to love? 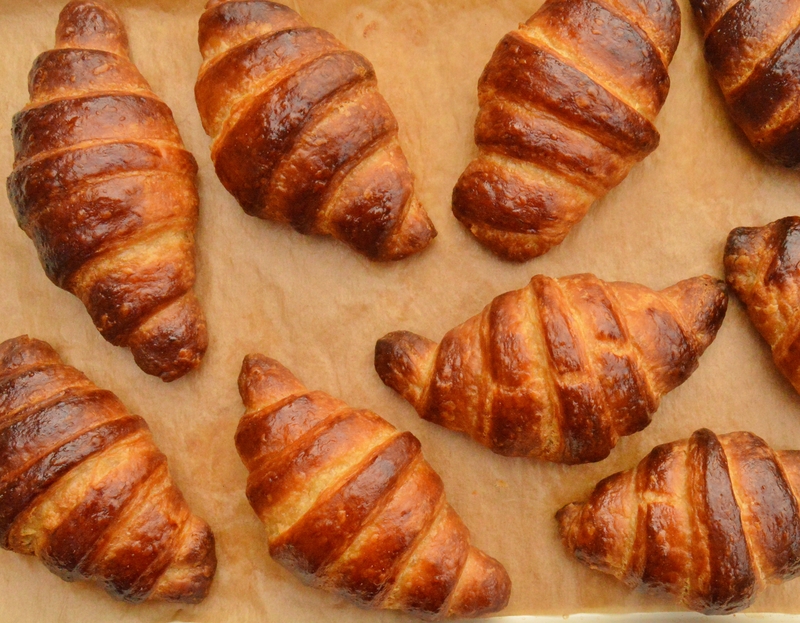 The recipe for these wonderful pastries, along with photos of the shaping, is here. Croissaladière: pissaladière made using croissant dough! 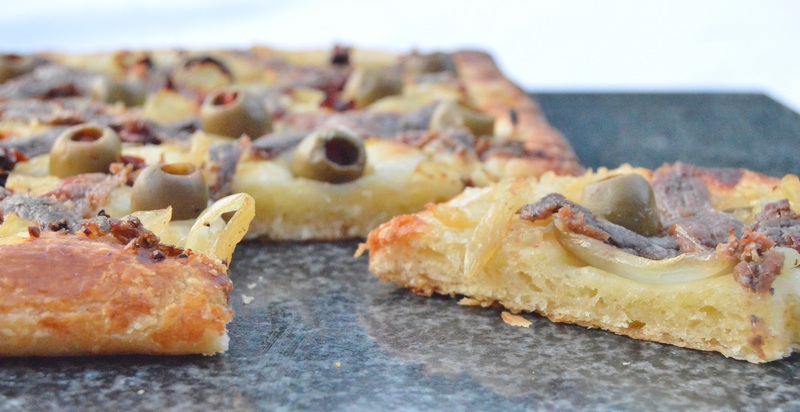 This is my take on the classic pissaladière (anchovies, olives and slowly cooked onions…. 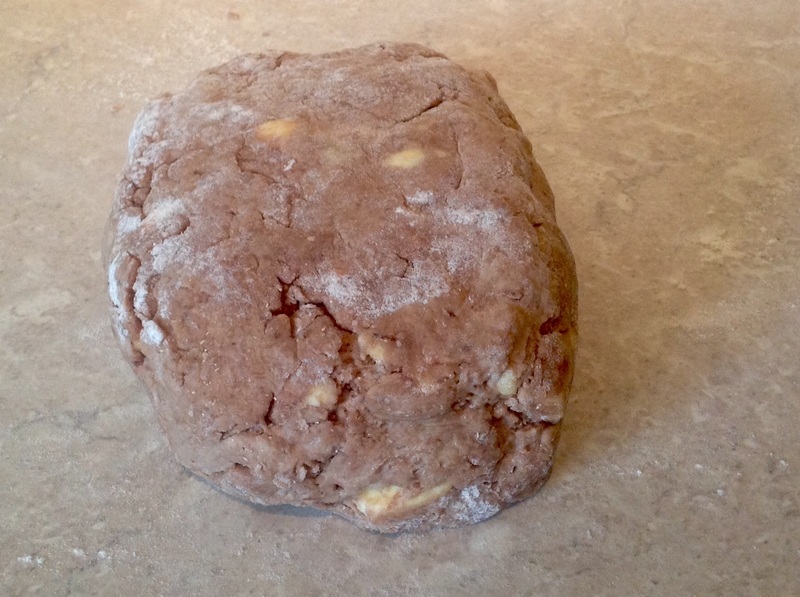 ), using croissant dough as the base rather than bread dough. 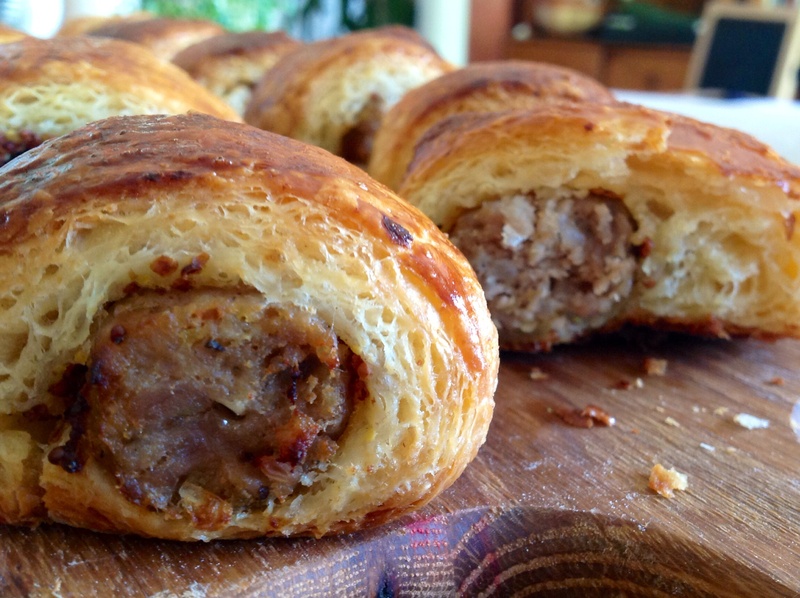 While sausage rolls made with a crisp, flaky pastry are a real comfort bake for me, using croissant dough instead of traditional pastry gives a heartier bite. 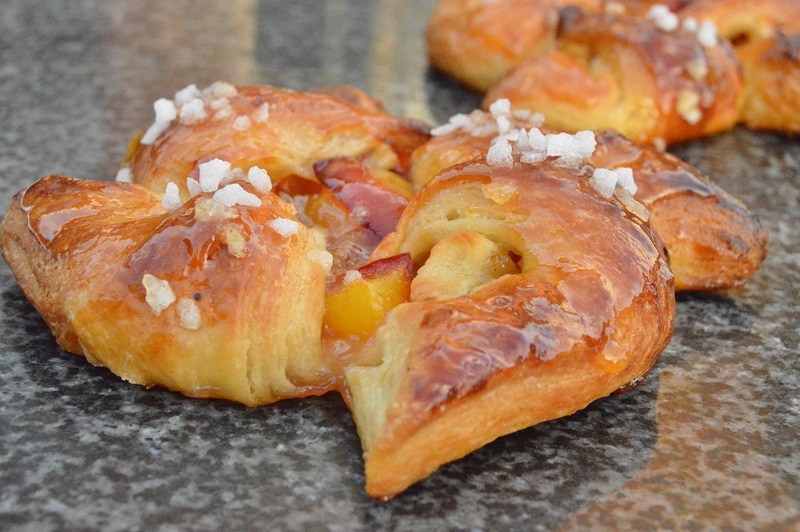 The simplest Danish pastries, also using a shortcut filling. The rough-puff pastry method is the method I use more than any other method when it comes to shortcut puff pastry. It is not as quick as the grated butter method above for croissants, but it gives a better structure and is still easier than making traditional croissants. The proportions of the key ingredients (flour, butter, sugar, salt and water) are the same as above. You just add the butter in small chunks with the flour rather than grating it in and proceed in a similar way: rolling out the dough thinly and giving it 3 envelope folds with a 20- minute chilling in the freezer between each turn. Thank you. I love shortcuts when they work! I can’t wait to try this! Thanks for explaining the difference between the traditional method and this faster version. A pleasure. I hope you enjoy them: they are quite addictive! Love the small chunkes tip! I usually cut the butter into tiny little pieces for pie crust but never thought to do that with puff pastry and I’m not keen on grating the butter but I have…thanks!